I happened to taste one of my friend's Tomato dosa with tomato thokku. 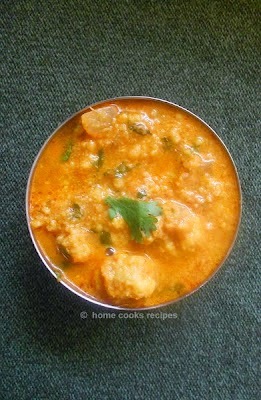 The next day i prepared the thokku, as i loved it more than the dosa. But when i tried tomato dosa and had it hot, i could'nt stop trying tomato dosa again and again. every time i tried, i followed different versions. 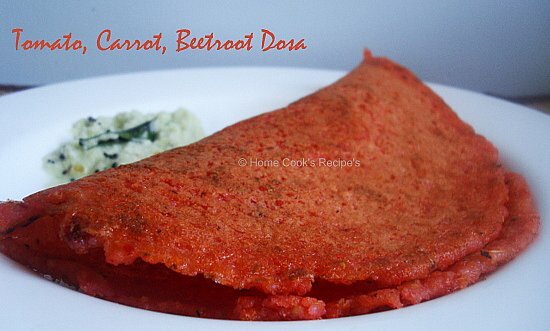 once it was more like an adai, and now you see is with carrot and beetroot. My son love all the versions. and that's enough for me. * Soak the Par Boiled Rice in water for about 2 - 3 hrs. 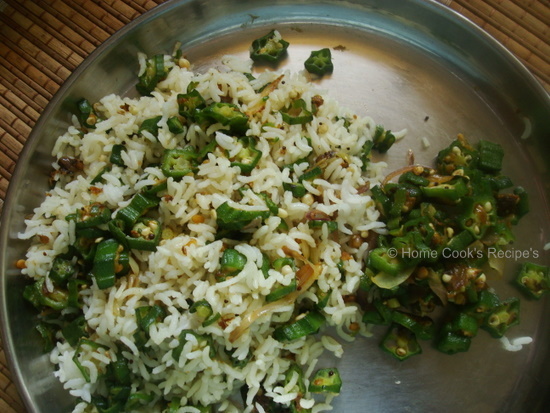 * Grind the Rice along with Cumin, Ginger and Dry Red Chilli with some water to a coarse consistency. need not grind the batter finely. * Grind the Chopped Carrot and Beetroot slice with few tsp's of water into a puree form. Now add chopped tomatoes and grind along the Carrot + Beetroot. * Mix the Tomato, Carrot, Beetroot puree to the grounded rice batter. add salt to taste. 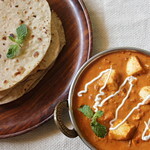 * Heat Tava, pour 3 heaped spoons of batter on the tava and make dosa like patterns. add oil and cook the dosa in medium flame. each dosa takes nearly 2 minutes to get cooked. see to that the tava is not so hot, while pouring the batter on to it. Serve with Coconut Chutney or Tomato thokku. Iam sure kid's will love this red colour dosa. you can also grate some cheese on dosa and wrap as a roll and serve to kid's. The sourness of tomato and the spicy red chilli makes it a tasty dosa. carrot and beetroot makes it healthy finally. Vendakkai poriyal is one of my favourite from mom. This is her recipe and this recipe got a secret ingredient. i will reveal the secret in the ingredients list. before that let me ramble on these ladies fingers. Ladies Finger always remind me of my mom's fingers. i would say her fingers is the most beautifull one's, Thank God! she passed me 70% of it. My mom and my grandmom prepares this poriyal for me exactly before and on the day of my mathematics exams. it is told that, on having ladies finger, you can score good marks in maths. Yes i am poor in maths. but i managed to score good marks, all bcoz of Vendakaai!!! We went on a trip to Mysore & Ooty last week. Though Climate was not pleasing, we enjoyed the offseason with less crowd. I bought lots of vegetables from Ooty - Farmer's Market for very low prices. I bought Kg of these ladies fingers for Rs.8. They were so fresh and tender. whereas in chennai, i have to shed Rs. 20 for a Kilo. to get fresh ladies finger from my keera kaara amma. she brings it only on demand that too. 1. 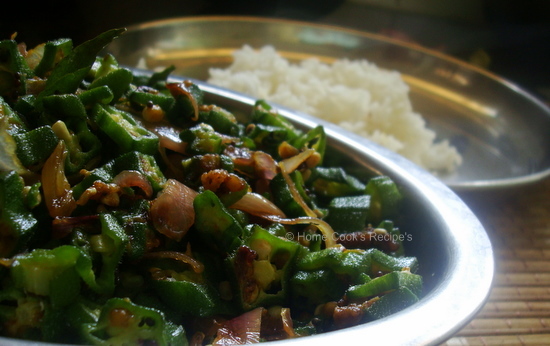 Ladies Finger / Okra / Vendakaai - 1 Kg. Trim the head an tails of Ladies finger and slice the Ladies Finger very Finely. Heat Oil in a Thick Bottomed Pan / Kadaai. add mustard and let it pop. add split urad dal and curry leaves. saute it. Add chopped Red Onion to the Pan and fry it along. add salt and red chilli powder and saute it. 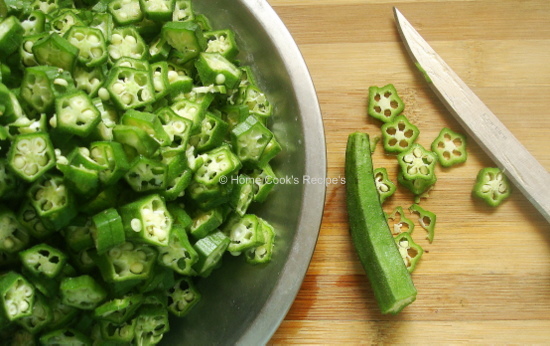 Now add the finely chopped Okra/ Ladies finger and fry it. it first turns into dark green colour and then it becomes sticky. when it becomes sticky add corn flour or Rice flour to the ladies finger and saute them. fry it for atleast 4-5 mins in slow flame, untill the ladies finger becomes less sticky and cooked. 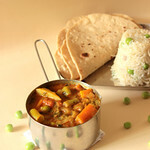 serve with hot rice with Ghee or with sambhar rice. okay what does the corn flour do, it helps in preventing the sticky and also it gives its share of taste. You can also add rice flour, it also does the same job and i love the rice flour version than the corn flour version. Hope you will try and enjoy!! First, I have to mention Sharmilee, for tempting me to try this eggless cake by sending her Cake picture. Thanks Dear! Yesterday my very depressed mind needed chocolate and when i opened my fridge, nothing other than cocoa powder was chocolaty there. 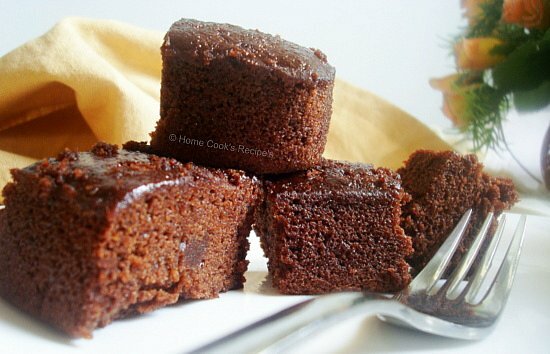 and there sharmilee's cake pic came before my eyes, and i proceeded to bake this super moist chocolate cake with the recipe from here. This cake is made with Vinegar and its tough to spot it on tasting. Though there may be some hint of vinegar, when you taste soon after baking, the next day after refrigerating, the light hint also vanishes. I much liked the cake, the next day after refrigerating. my recommendation is to refrigerate the cake first and serve next. Mix the above wet ingredients along sugar in a bowl together. Let the Sugar Dissolve well. so that no lumps of cocoa powder / all purpose flour are there and also the baking soda is mixed well with the flour. Mix the Dry Ingredients along with the wet ingredients and stir slowly. make sure no lumps are formed in the mix. Pre-Heat the Oven to 180c and Grease a 7 by 5 inch pan with few oil drop's. Pour the mix on to the greased pan and bake it for 45 mins exactly. Let the Cake cool down for 10 minutes. Put the Cake in refrigerator for about 2 hrs and serve chilled along with Whipped Cream frosting. 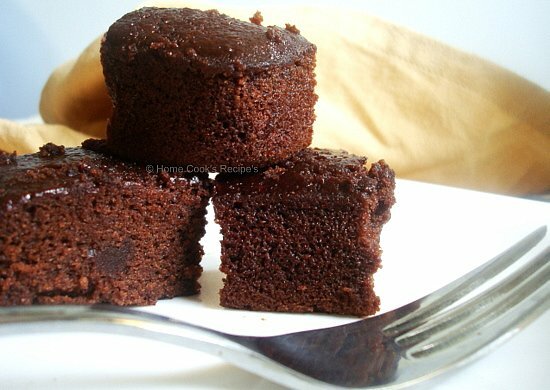 I felt the cake tasted little like brownie, i loved and enjoyed this cake very much. When i spotted brussels sprouts at vegetable shop-Pazhamudhir cholai, i grabbed a pack without thinking what to cook with it. I have seen it on Indira's blog, but forgot its name, finally i got its name from the bill given by the shop. The next day i prepared brussels sprouts fry, just as i prepare cabbage stir fry. it tasted good. I also added flax seed powder towards the end, and it gave a nice taste. I add flax seed powder, which has Omega-3 fatty acids, to all my poriyal / stir fry. Capsicum / Bell Pepper - few chopped pieces of red and green colour bell pepper. Wash the Brussels sprouts and remove the green outer cover of it. slice them into thin slice's. In a Pan, heat oil, add mustard, when it pop's, add split urad dal, red chilli and curry leaves & roast them. Add finely chopped onion's and capsicum's and fry along for half a min and then add the chopped brussels sprouts and fry it. it takes some 3-4 mins. Add salt to taste. you can also add flax seed powder or grated coconut before the final stir. 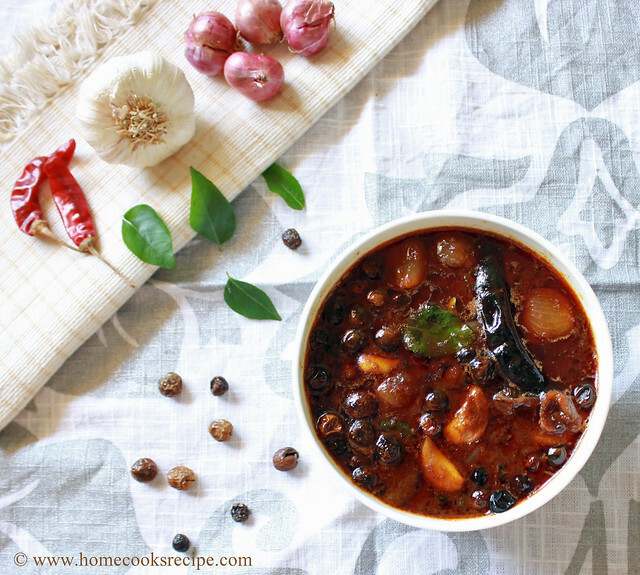 Serve it with sambhar rice or with some kuzhambu. 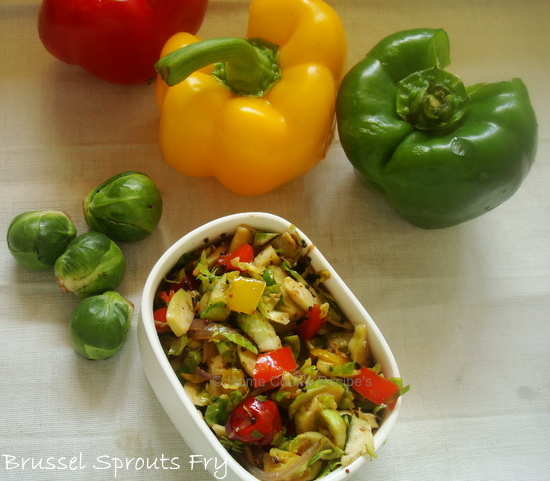 The capsicum's and brussels sprouts mingle well and add on flax seed powder gives a different make over to this stir fry. Life is busy here and iam trying to organize and learn to work. Iam also spending more time towards Nature, which cleanses my mind and helps me to face this world. so do u understand my mind is not stable and thus i could'nt concentrate here. Pray for me. Iam hoping for a better sunshine tomorrow and more happier tommorrow.